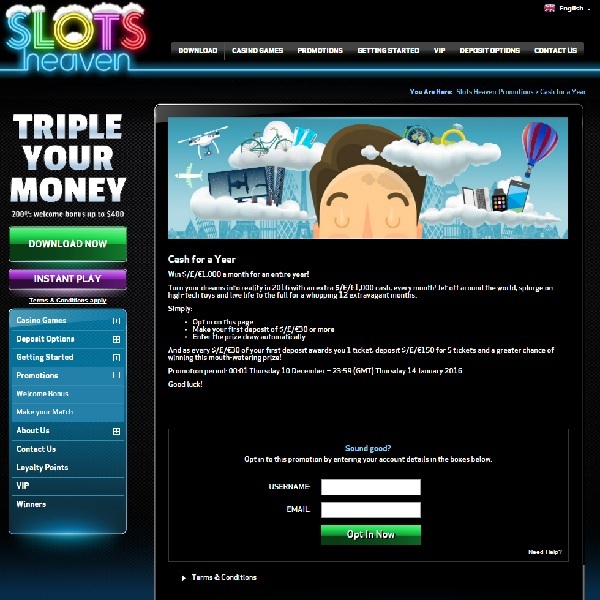 Slots Heaven Casino is running a promotion which could make 2016 an absolutely fantastic year for one of its players. The casino is running a competition which will see the winner receive £1,000 cash every month next year. All you have to do is opt in to the promotion and make a deposit of at least £30 for an entry to the prize draw. Furthermore, you could choose to deposit more and receive more entries for instance deposit £150 for 5 tickets of £300 for 10 tickets. You have until Thursday 14th January to enter the competition so there is plenty of time to make your deposit. Imagine what you could do with £12,000 extra cash next year, head over to Slots Heaven Casino and with a bit of luck it could soon become a reality.